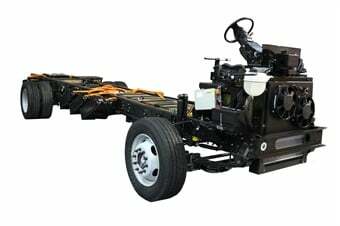 Responding to fleet market demand for complete, body-ready chassis, Motiv Power Systems announced its Electric Powered Intelligent Chassis (EPIC) all-electric family of chassis for 2018. Debuting at Ford’s booth at the Work Truck Show in Indianapolis and based on the popular E-450, F-59,and F-53 platforms, the EPIC all-electric chassis are production line ready, drop-in replacements for the equivalent ICE chassis and are available for a wide range of medium-duty body applications including walk-in vans, box trucks, school buses, shuttle buses, work trucks, and specialty vehicles. As a zero-emissions offering, the EPIC family of all-electric chassis qualify for regional and national incentive and subsidy programs including Volkswagen settlement funding. Having received Ford’s qualified vehicle modifier approval (EQVM), the new EPIC chassis family provides a broad range of capabilities in range, power, and capacity equivalent to common combustion alternatives with the added benefits of near-silent operation and smooth power delivery. Featuring Motiv’s award-winning and industry-proven Smart Power Control Technology, each EPIC chassis is available with universal charging compatibility and secure remote telematics and diagnostics for unparalleled charging flexibility and fleet/driver connectivity.